Want more room? Want more style? 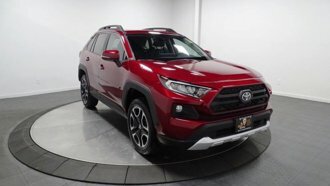 This Toyota RAV4 is the vehicle for you. No matter the weather conditions or terrain, this Silver Sky Metallic AWD Toyota RAV4 handles with an elegant confidence. Fine interior appointments complement this vehicle's unprecedented performance. Beautiful color combination with Silver Sky Metallic exterior over BLACK interior making this the one to own!